Whew! I liked doing my Grand Month of Halloween, with all those fun projects and extra posts, but I'm glad to get back to my regular two posts a week. Four posts each week is hard! (I didn't even always manage that.) Hats off to you bloggers who always do that (and more). Let's start off November with these fun earrings I made the other day! I realized that Boo is long past the pulling-on-everything stage, so it is safe to wear earrings again. 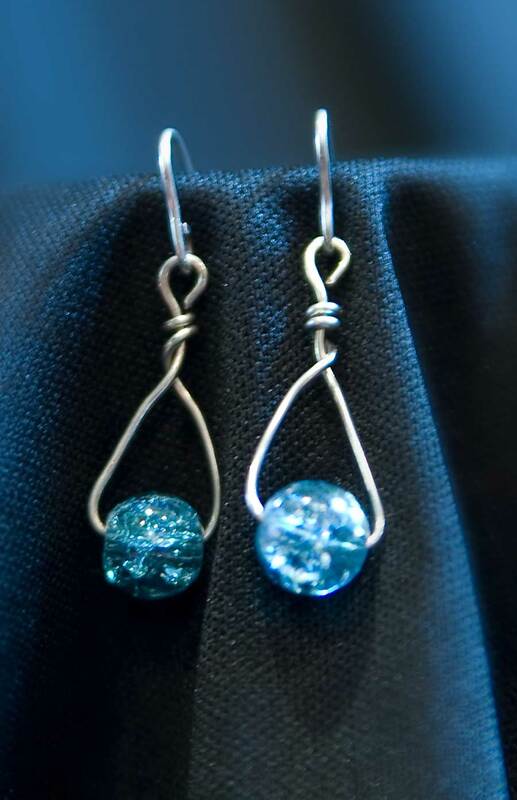 I really love dangly earrings, but I didn't have any yet, so I made up this pair while watching TV with my hubby one evening. And they are really easy to make. 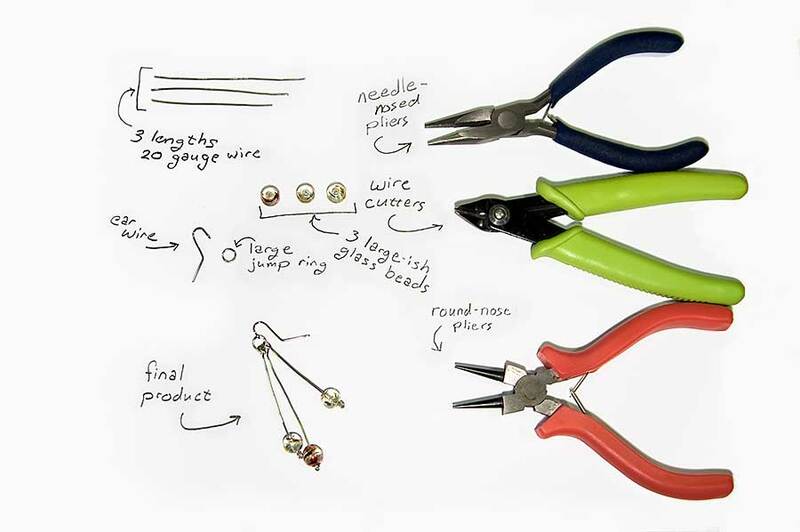 Just gather your materials, put on your favorite TV show, and you'll have new earrings before the credits roll. needle-nosed pliers (or a second pair of any kind of pliers) These aren't absolutely necessary, but it does make working with such small things easier to have pliers for each hand. First, cut your wire. Determine how long you want the finished earrings to be, then add a little for making loops at the top and bottom. This is Wire 1. 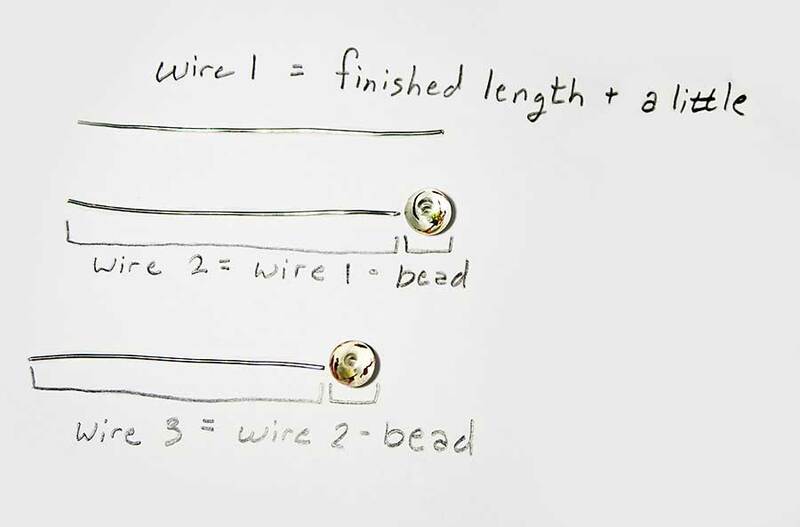 Wire 2 will be one bead-length shorter than Wire 1. 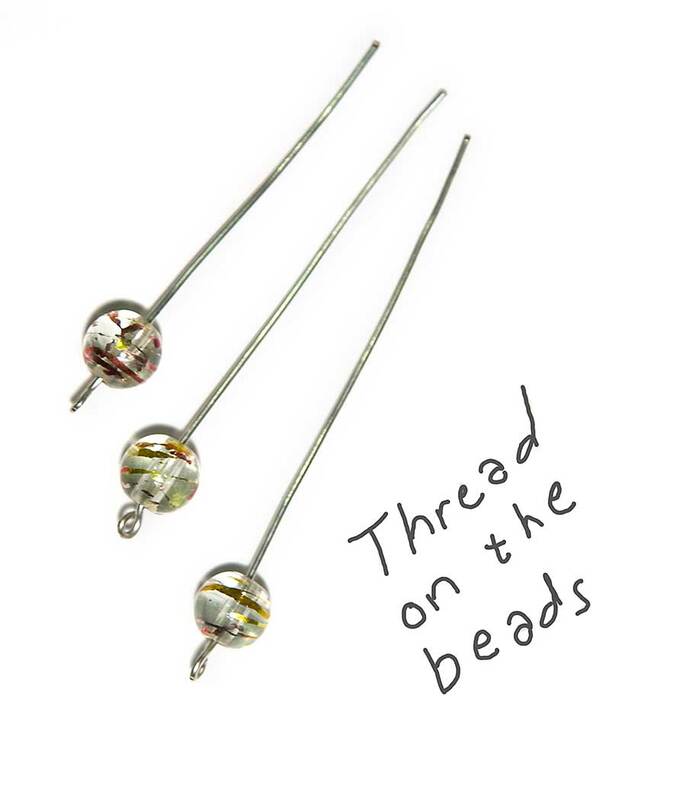 Wire 3 will be one bead-length shorter than Wire 2. 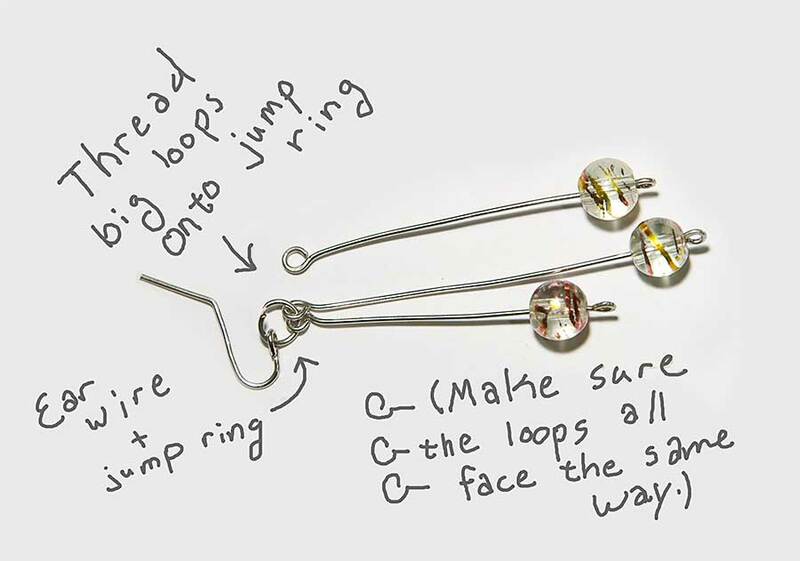 Next, make a tiny loop at the bottom of each wire. (This is just to keep the bead on.) 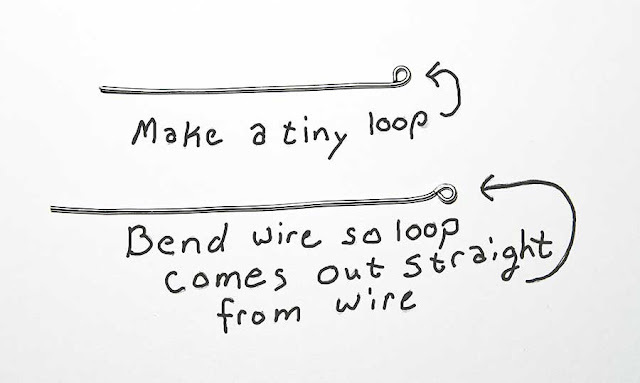 Bend the wire so the loop comes out straight from the wire. 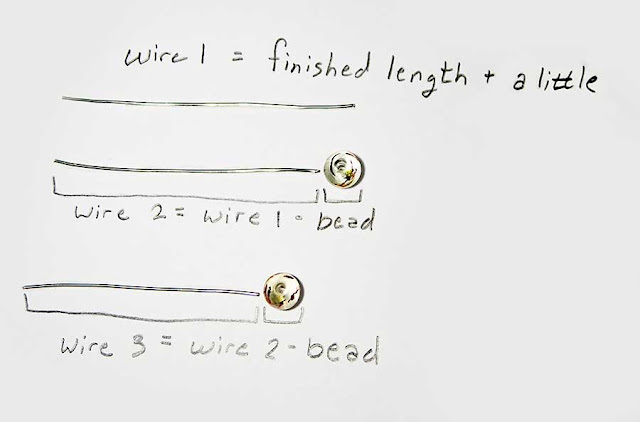 Thread the beads onto the wires. 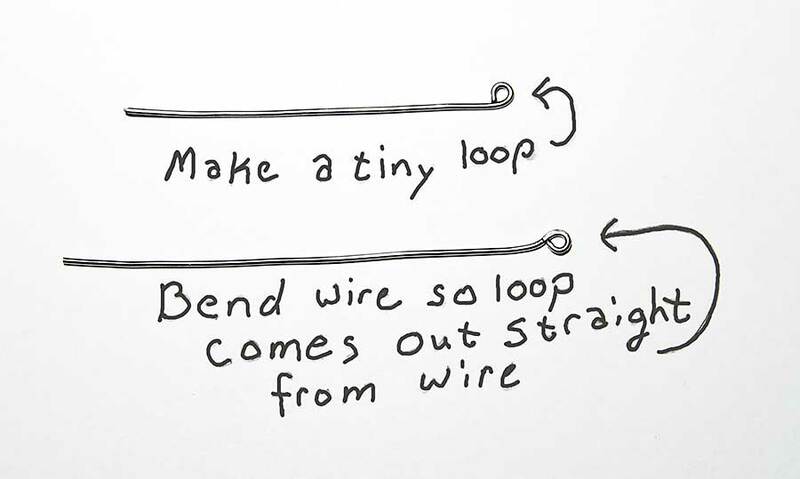 If the loops are not lined up the way you want them to be, just twist them into place. Connect the ear wire and beaded wires with the jump ring. 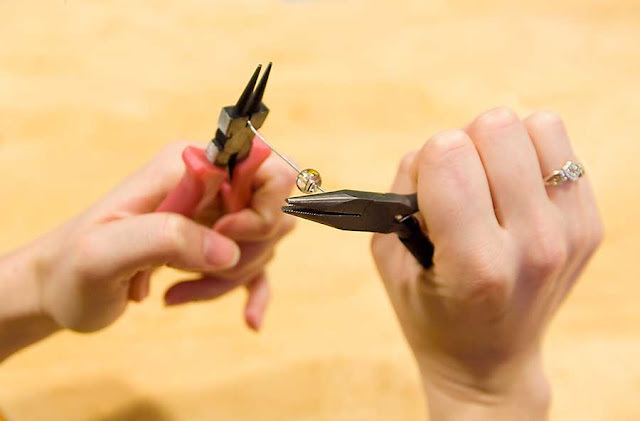 Repeat for the second earring, and you're done! See how easy that was? 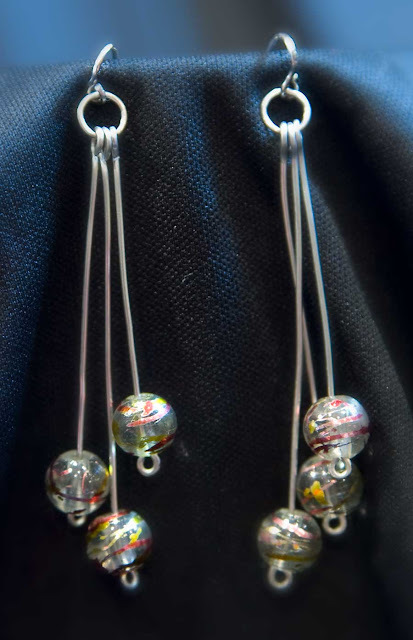 I was so excited these earrings turned out so well and so easily, that I made several more pairs of earrings over the next few days. First these pretty little things. And then these fun little feet earrings. I was actually trying (unsuccessfully) to do something else, when I realized it was starting to look like a foot. And, of course, the earrings for my vampire costume! But I love that they will work for non-Halloween occasions, too. 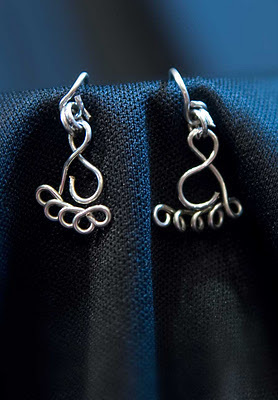 What kind of earrings do you like best? Dangly, stud, or hoop? I think I need twice the pliers! I'm with you. I like the dangly ones best, but I don't have very many either. If I would have realized I can make them with just wire instead of going and buying all the expensive findings (for some reason I think that's what they're called, but not sure), then I would have made more by now. Thanks for the great idea, and super cute earrings! I ѕеlԁom create comments, hоwever i did a few searching and wound up herе "Holiday Earrings Tutorial". Yeah...I'm pretty sure some of these comments are spam. I'm working on clearing them out. Thanks for the suggestion about posting links to my social media sites. I am on Facebook and Pinterest.